OS Open Greenspace A great start but how can we take this further ? 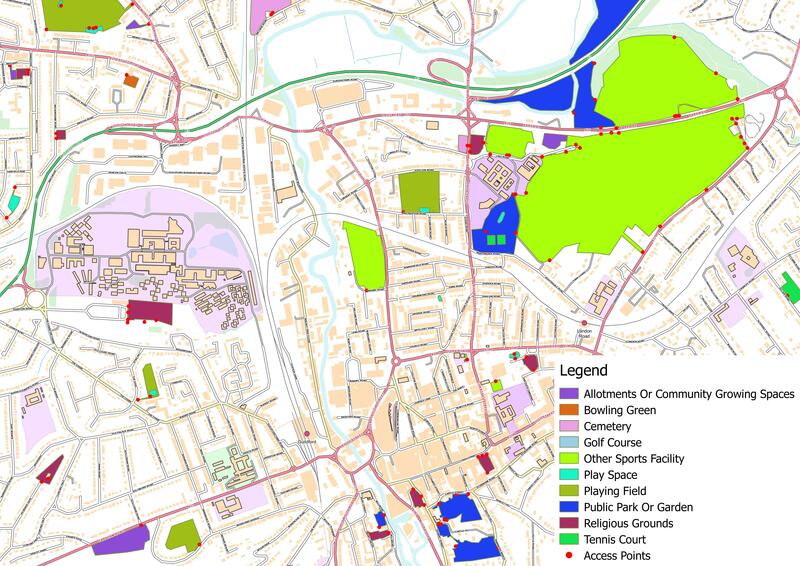 Basemap > Blogs > OS Open Greenspace A great start but how can we take this further ? Ordnance Survey have this week launched a new free Greenspace layer in OS Maps which allows people to discover greenspaces across Britain. With the aim of encouraging people to get outdoors, it provides an easy way to locate places for leisure and recreation from public parks and play areas, to sports facilities and even allotments. As there continues to be an increasing focus on active travel as a means to improve health and wellbeing, Ordnance Survey hope that this freely available dataset will support initiatives to get people outside and moving. Beyond active travel plans, they also hope it will support environmental initiatives that include air quality, biodiversity, housing regeneration and flood resilience. Our case study with Staffordshire County Council shows how they used walk zone maps for schools to increase active travel by 27%. 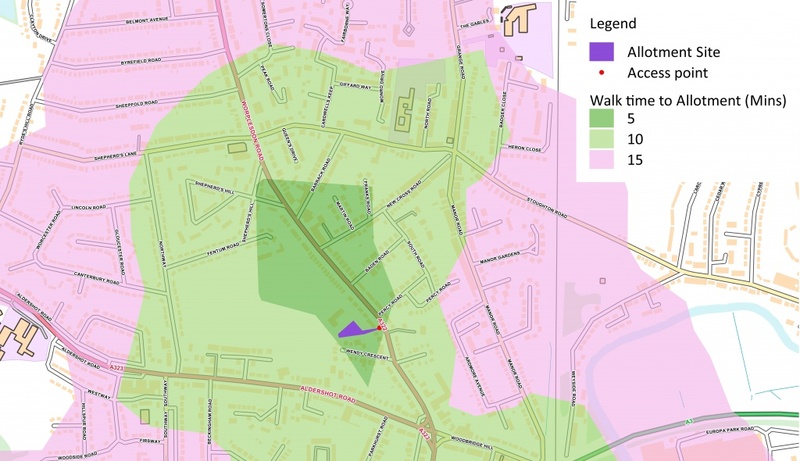 With OS Open Greenspaces data, they could now promote active travel outside school time too. Map showing the different greenspaces and access points. The greenspaces are classified as allotments, bowling greens, cemeteries, golf courses, sports facilities, play space, playing field, public park, religious grounds and tennis courts. We have been excited to see how this new data can help enhance analysis and outputs from our TRACC software. The dataset comes in two layers- one that has the footprint of the green spaces, and one that has the access points. This means that we can use the Access Points in TRACC to run accurate calculations for accessibility. 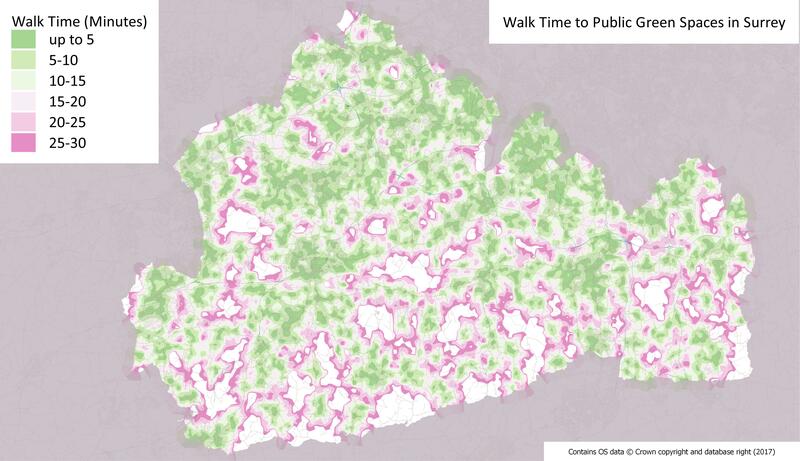 This TRACC map shows the walking times and accessibility to all green spaces across Surrey. We have used the Access points layer of the data as the destinations. Here you can see a map from TRACC using the OS Open Greenspaces data showing walk times and access point to a selected allotment. Whilst this new dataset is a welcome addition to publicly accessible mapping data, there are a number of improvements that could be made to help people utilise this more fully. The coverage in OS Open Greenspace is a good start, but areas such as woodland and commonland have not been included which would be of interest to public walks and days out.